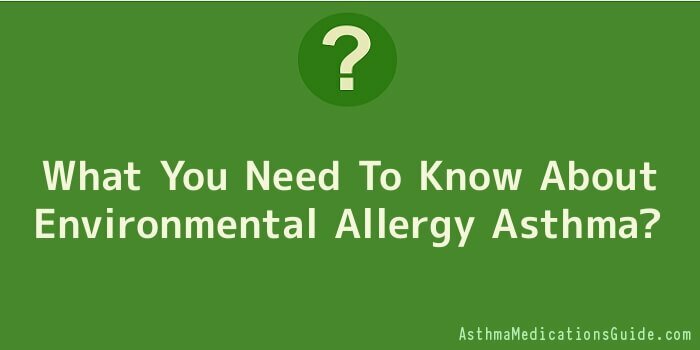 What You Need To Know About Environmental Allergy Asthma? Asthma is a common condition to both children and adults. Triggers often include environmental factors that are not always easy to control. During an asthmatic attack the bronchioles and alveoli (tiny air sacs) in the lungs become over inflated with air that is deprived of oxygen because it can’t be exchanged. The sufferer struggles to breathe even though their lungs are hyper-distended with air. Fortunately, there are ways you can minimize your exposure to these irritants and get relief from your allergies and asthma. Environmental allergy asthma is triggered from both indoor and outdoor environmental hazards. Americans spend approximately 90% of their time indoors between time at home and at work. Therefore, indoor irritants can play a significant role in triggering an asthmatic attack from environmental allergens. It is important the asthma sufferer know what their environmental triggers are and when they are being exposed. These triggers should be included in your asthma plan for you or your child. The plan should also include instructions for medications, what to do in case of an attack, when to call the doctor and emergency phone numbers. Some of the most common indoor environmental triggers are allergens such as second hand smoke, dust mites, mold, cockroach and other pests, household pets, and by-products of combustible materials. Pest control (cockroaches and rats) is an ongoing problem in many residential and public buildings. Research has shown that cockroaches and rodents are the source of potent and persistent allergens that cause asthma attacks. But the old way of getting rid of these pests can be as much of a trigger to asthma as the pests themselves because of the toxic products that are used to kill the cockroaches and the rats. The Environmental Health Watch, in cooperation with the Cuyahoga Housing Authority, underwent a study of pest control using mechanical capture, low risk pesticides and environmental controls. The study required the intense cooperation between the residents, the housing authority and the maintenance departments. After several months the pests were almost totally eradicated. The system worked well but it was labour intensive. Toxins that would have been exposed to the children and adults who suffered from chemical environmental allergy asthma were decreased significantly. There are a multitude of other environmental allergy asthma triggers that must be evaluated and tested to ensure that you know what your specific triggers are. Some of these triggers include pollen from trees and grasses, hay and ragweed, mold, dust mites, insects, foods, sulphites, and food preservatives. Other pollutants in the indoor and outdoor environments can include traffic, smoke, wood burning stoves, animals, ozone, and smog and sulphur dioxide. The weather also affects some asthmatics with changes in the barometric pressure, cold air and humidity. Around the house asthmatics are affected by chemicals in paint, cleaning products and dust from wood and latex gloves. Vapours from pesticides, chalk dust and scented candles round out are the possible irritants and triggers for allergies and asthma. Environmental allergy asthma triggers are important to understand, and avoid, in order reduce the risk of further asthma attacks.